Federal officials see more wildfire smoke and other negative effects on the horizon for the Northwest as a result of climate change. The 2015 drought, with soaring temperatures and water problems, could be a vision of our future, according to a new report. The 1,000-plus-page report, produced by the U.S. Global Change Research Program, is the most comprehensive evaluation to date of climate change’s effects on the nation’s economy, human health, agriculture and environment. Thirteen federal agencies contributed to the report, which was required to be published by Congress. The federal report’s stark, direct and largely negative projections are at odds with President Donald Trump’s skeptical view of climate science. But federal officials, like National Oceanic and Atmospheric Administration researcher David Easterling, left little room for ambiguity about whether climate change was real and who was causing it. Sea-level rise and extreme events like heavy precipitation are continuing to increase, he said. Soon, if emissions aren’t significantly reduced, ecosystems will transform and species will go extinct. By the end of the century, the report says, climate change could slash the country’s economic production by as much as about 10 percent. Warming temperatures are expected to reshape the Pacific Northwest as winter precipitation increases overall, but with greater variability from year to year, according to a chapter of the federal report that detailed expected effects on the Northwest. That means we can expect both more drought and more extreme rain events. Temperatures in the Northwest have risen nearly two degrees since 1900, according to the assessment. The idea that climate change’s effects are in the “far-off and distant future” is mistaken, said Heidi Roop, a research scientist with the University of Washington’s Climate Impacts Group, which was involved in writing a chapter of the report. “We are observing increases in temperature in our region, and around the globe, now,” she said. The report predicts that warming’s effects will shake the Pacific Northwest’s regional identity at its cultural core. If emissions are left unchecked, salmon are projected to lose about 22 percent of their habitat by late century due to warming stream waters, the report says. Revenue from skiing and other snow-based recreation could drop by more than 70 percent annually. Northwest crops are seeing negative effects already, according to the report. Higher spring temperatures are causing tree fruits to flower earlier, which creates pollination problems. Summer heat stress can sunburn apples and berries, causing damage in harvest and transport, according to the report. More water storage in reservoirs will be needed to deal with changing precipitation patterns (more rain, less snow) and increased irrigation demands for Northwest crops, the report says. Long term, temperature changes and severe heat could force premium wine-grape production away. Ocean acidification and harmful algal blooms “could lead to extensive fisheries closures, across all of the region’s coastal fisheries,” the report says. Nature’s drama will rise, too, as landslides, wildfires and flooding increase in frequency and intensity. And our infrastructure, which is designed for the climate of the past, isn’t ready, the report says. Saltwater could intrude into coastal groundwater supplies. More wildfires could cause more energy, transportation and water-quality problems. Pests, wildfire and extreme heat have taken a toll on health, according to the report. The Pacific Northwest recently saw more cases of Lyme disease, which correlates with higher temperatures and changing tick habitat, the report says. West Nile cases have risen along with temperatures. In Oregon, E. coli and salmonella infections climbed during high heat. Nighttime heat waves, dangerous here because people are not acclimated or adapted to hot weather, have been increasing over the past century. 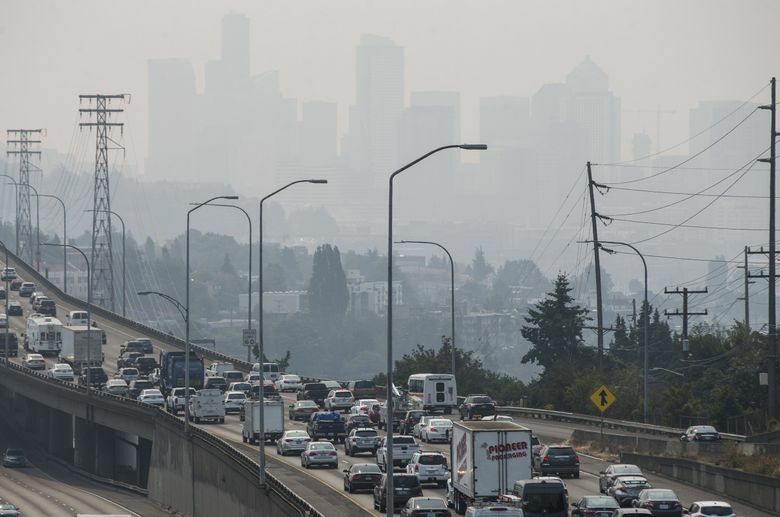 Earlier this year, wildfire smoke smothered Seattle in an unhealthy haze of floating particulate. Air quality is likely to worsen, the report says, as fire seasons get longer because of dry forest conditions. Even with improvements in greenhouse-gas emissions, “airborne particulate levels from wildfires are projected to increase 160% by mid-century,” according to the report. Rates of respiratory illnesses will likely follow that trend. Natural disasters and other climate stressors could also raise the risk of mental health problems, the report says, noting that Northwest states provide relatively little access to care for mental illness compared to other states. We may have already seen a glimpse of our future. In 2015, temperatures were about 3.4 degrees above normal and winter provided record-low snowpack in most places. Agriculture losses exceeded $633 million in Washington because of drought, according to the assessment. Some Northwest ski areas never opened. Harmful algae bloomed, and high levels of toxins closed salmon, shellfish and crab fisheries along the coast. Wildfires caused Seattle City Light to shut down power transmission lines originating in the North Cascades. Warm water temperatures caused widespread salmon die-offs in several streams. It was a difficult year, and one that “may be commonplace in the future,” the report says.